In 1950, at the Paris Auto Show, the organizers of the 24 hours of Le Mans invited the Porsche family to enter a car in the 1951 race. Porsche accepted and decided to use one of their left over aluminum bodied Gmünd Coupes as their entry. In fact, they prepped four cars for testing with the intent to enter two cars in the 1951 race. 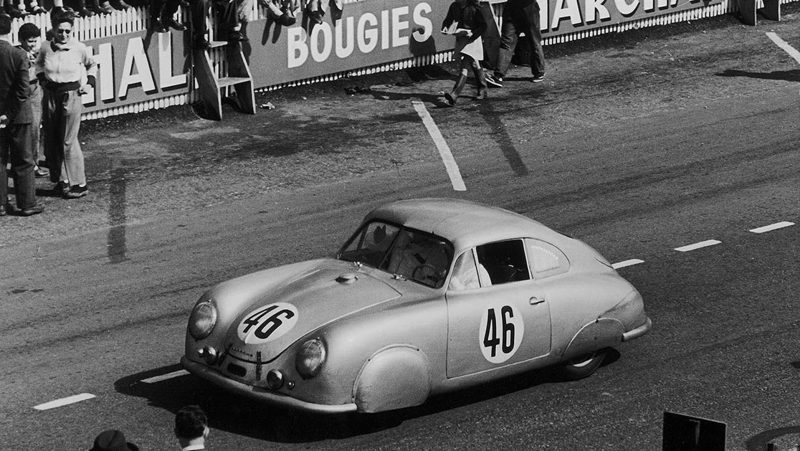 The two Porsches that traveled to the race were the #46 and the #47 (both 1951 Porsche 356 SL Gmünd Coupes). While #47 crashed during night practice and never officially entered the race, #46 went on to win its class and finish 20th overall. Not a bad showing for Porsche's first ever race as a company. Despite this Porsche's storied history, it was sold to a private owner who almost immediately cut off its roof to lighten it and turn it into a speedster. It's amazing to me that this could happen and that Porsche doesn't own this car. However, as you'll learn in the video below, at the time, it was just "some old race car". Now, I'm sure Porsche would pay a very pretty penny to have it back in their collection as they currently use a '52 Gmünd coupe, in disguise, to represent their first Le Mans winner at the Museum. Fast forward nearly 6 decades to Emory Motorsports where one of Rod Emory's original clients took possession of this now famous Porsche from the owner who had it, and raced it, since 1957. The new owner, Rod and his team spent nearly two years uncovering the history of this 356 and determined it was THE first Porsche Le Mans winning car. Once they presented their information to Porsche and its provenance was confirmed, the real restoration work began. The video above, featuring, Rod Emory, Jay Leno, the car's owner and the Porsche itself is one of the best I've seen in a while from "Jay Leno's Garage". It details the history and restoration of this piece of automotive royalty in a succinct and easy to follow manner. It's clear from Rod's knowledge on the history of this 356, and his description of the restoration and build, that the finished product is worthy of every accolade its received so far.